Note: Samples are available now in limited quantity. To request a sample, please click here. 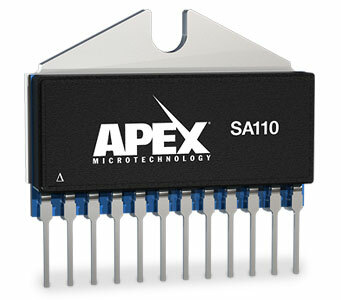 The SA110 is Apex Microtechnology’s first high current, high voltage half H-bridge to utilize Silicon Carbide (SiC) MOSFETs with integrated gate drive. SiC MOSFETs provide reduced switching losses, lower conduction losses, and a low dependency of RDS(on) over temperature. 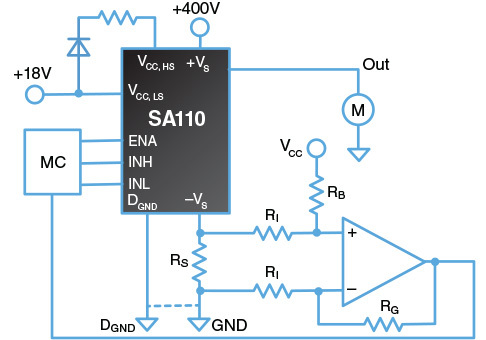 The SA110 features integrated gate drive control, a very high 400 kHz MAX switching frequency, and 28 A of continuous output current in the A grade variant. This hybrid is offered in a 12-pin PSIP package to provide a compact footprint along with protection features. With integration of the gate drive, switching speeds are greatly improved as parasitic impacts are reduced and easier to control. SA110 is ideal for applications where focus is on over temperature performance, high efficiency, and compact design.